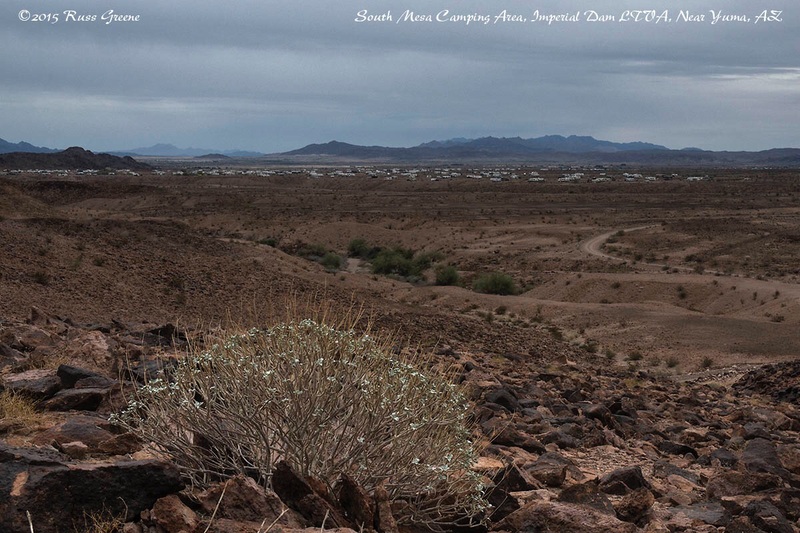 BOONDOCKING/DRY CAMPING AREA: South Mesa, one of many camping areas within the BLM’s Imperial Dam LTVA (long term visitor area). Many of the areas in the LTVA seem to blend into one another making it difficult to tell where one ends and another begins. RATES: $40 two weeks, $180 for the season of Sep. 15 – Apr 15; no charge out of season with 14 day limit. PHONE: 928-0317-3200 This is the Yuma BLM Office at 2555 East Gila Ridge Road. Music Row, Florida Flats. Is that like a subdivision? I’m thinking so. Florida Flats appears on a map given to me by the campground host at Imperial Dam LTVA, but I don’t recall seeing Music Row on it. I’m guessing that’s a camper innovation. 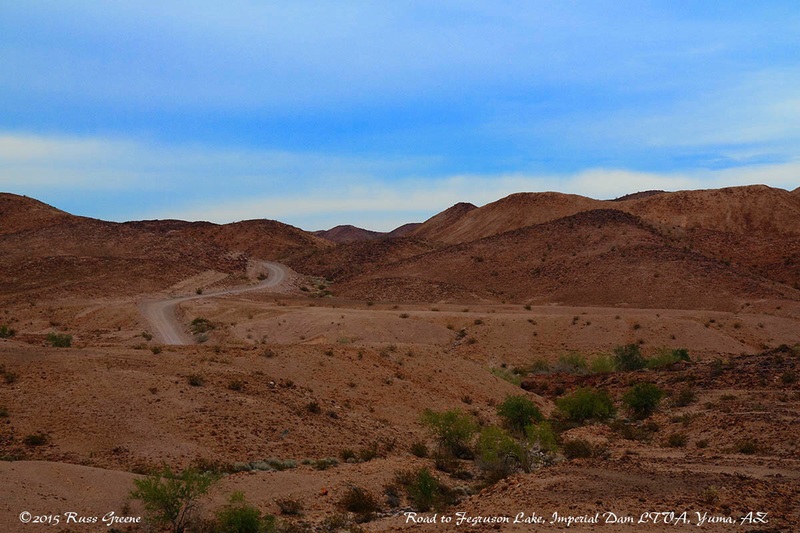 ACCESS: Paved roads to the LTVA. Within it Senator Wash Road is paved, but most if not all the camping areas require driving on dirt roads. The main dirt roads appear well maintained. I saw plenty of large Class A rigs, some towing trailers almost as large as the rig itself. In some areas it’s possible to camp within 100′ or so of the paved road whereas in others you can drive for miles along dirt before camping. SITES: There are no official sites. This is open desert. Park anywhere that has obviously been used before. LEVELNESS: It varies. Some spots may be perfectly level whereas others unusable due to slope. I got level pretty easily. There is a lot of nearly level terrain here. SPACING: It’s up to people that camp here with the proviso that the BLM states you must park at least 15′ from others. I’ve seen rigs parked closer but I think in those cases they were groups of friends. It may be possible to feel very private here but you’ll have to drive some distance. Otherwise, expect to have a neighbor within 25-200 feet or so. PICNIC TABLES: There are a few near the host office, umm, err Contact Station overlooking Senator Wash Reservoir but there is no camping right there. 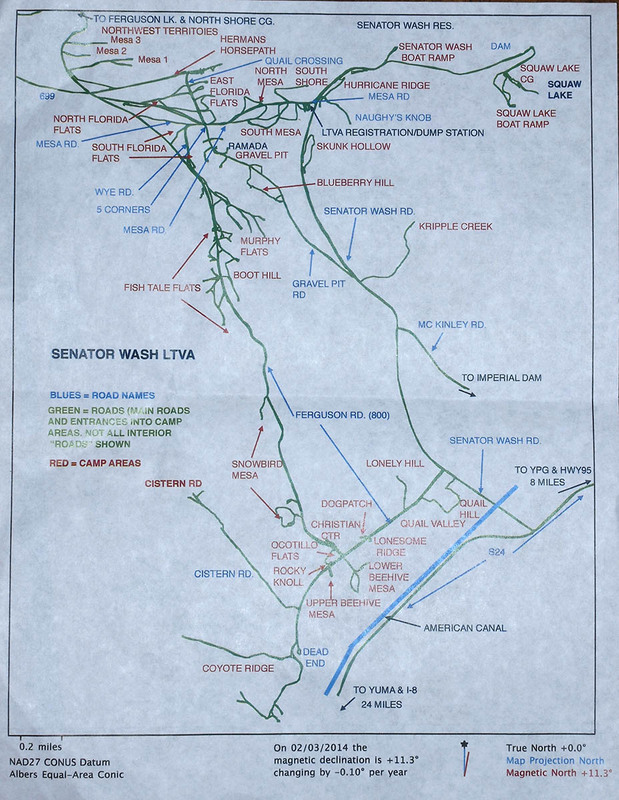 This map of Imperial Dam LTVA was obtained at the nearby Christian Service Center. I don’t know who the publisher is and I’m uncertain if all the camping areas shown reflect official names as recognized by the BLM. Campers will recognize them, however. Click to enlarge. DUMP STATION: Next to the Contact Point (Host) in the Mesa camping area, but that’s the only one. AT&T iPhone 5s without Wilson Mobile 4G booster: None, for the most part. There are isolated spots where you might find a signal, behind the host station being one of them. As often seems to be the case, when data download speeds are good without the booster they are not as good with it. Phone signal, however is improved, as is data upload speed. Over-the-air: Yes, but not very many stations. WiFi: Not provided by the BLM, but one of the campers here has a WiFi hotspot which is shareable. I did a little testing. It was not usable at my rig, but if I got close enough to the broadcast antenna it was OK, but on the slow side. SHOWERS: No, not at the LTVA unless you consider the outdoor showers by one of the restrooms, but a nearby BLM campground does have pay showers although I didn’t use or inspect them. I think that campground is called Squaw Lake, maybe 1.5 miles up Senator Wash Road from the Host station turnoff. RECYCLING: No and yes: there is limited recycling at the “liberry” which is camper run. Only CA redemption materials are accepted if that’s the right way to say it–stuff they can easily sell and then use the money toward running the liberry. BUGS: None really when I was there in January. TIME: Time isn’t usually one of the things I include in my campground reports because it’s most often obvious. Look at your watch or smart phone. Right? Not here. Technically this place is in California and on California (Pacific) time, but people here go by AZ time and if you make plans to attend any of the goings on you’ll be an hour late if you don’t go by AZ time. NEAREST FACILITIES: That’s going to be Yuma, maybe 30-40 minutes drive. There’s a small store somewhere closer but it has very little, I’m told. There is a convenience store at the Yuma Proving Grounds about 5-6 miles away. This is on an Army base and for American citizens requires ID, proof of auto insurance and vehicle registration in order to enter. I’ve been told you can get onto the base if you’re not an American if you know somebody there. I had to wait about 15 minutes for the gate-guard to process a day pass for me. A view of a portion of Imperial Dam Long-Term Visitor Area (LTVA) from the road to Ferguson Lake. This is an interesting and unusual place! It quickly became evident that there is community here and that many campers have been coming here for the Season (see Seasonality, below) or a large part of it for many years. Many of them know each other or at least know of each other. I didn’t know what to expect before arriving here and now about a week later I’m still discovering things. What kind of things? All kinds of things: There are maybe 25 named camping areas within the Imperial Dam LTVA. 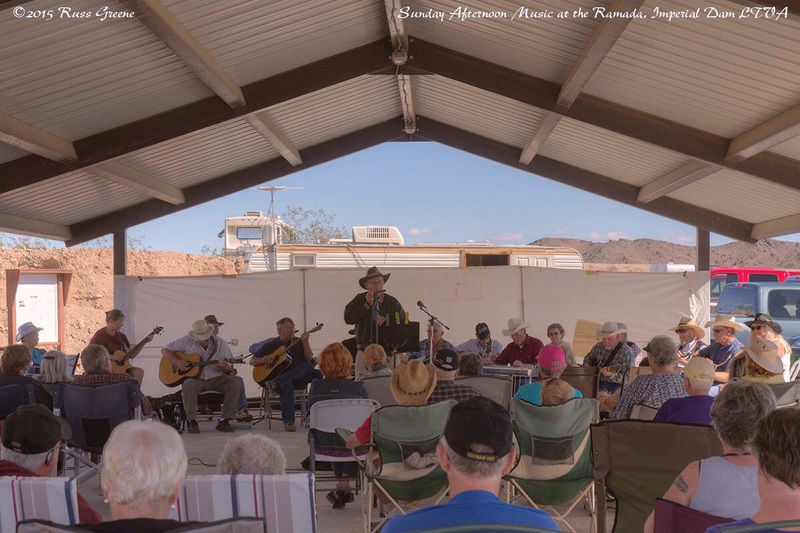 There is a real sense of community here with organized hikes, potlucks, musical performances, model airplane and race car meets, exercise and yoga groups, all organized by campers. There’s and ice cream truck that comes around every other Thursday I’m told, a guy who sells wifi, the nearby Christian Center where you can send and receive mail, get propane, telephone messages, get Internet access and more. There is lots of hiking around here and a bat habitat where, beginning about March, I’m told, you can see, well, bats. 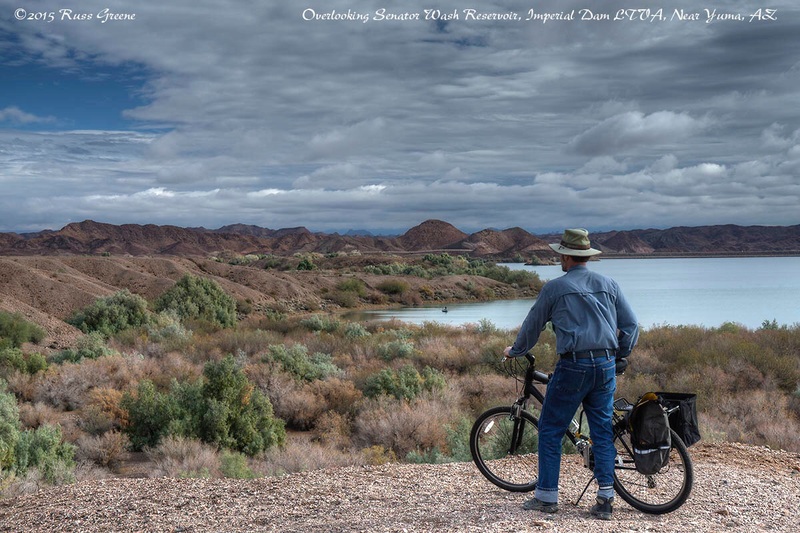 The Imperial Dam LTVA is a long-term visitor area under control of the BLM. Apparently many snowbirders come here from colder climes in order to wait out the winter before returning home. Others are full-time RVers who may stay here for several months during the winter, and some like me are just passing through. The Season runs from Sept. 15 – Apr. 15 and a camping permit for the entire 7 months is $180. Two week permits are $40. 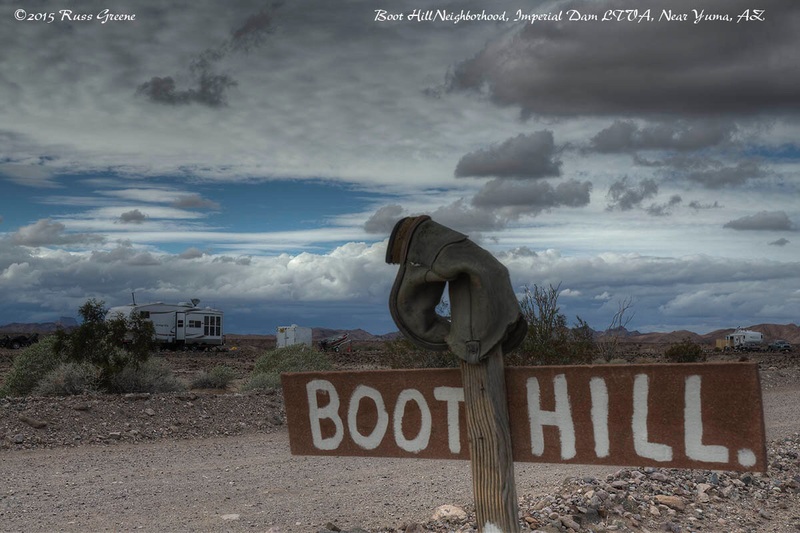 Outside of the season there is no fee to camp here, nor are there any services, and a 14 day limit is imposed during any 28 day period after which a move of 25 as-the-crow-flies miles is required should you wish to camp on BLM land where it’s free. Bear in mind that outside of the season it tends to be very, very hot here. 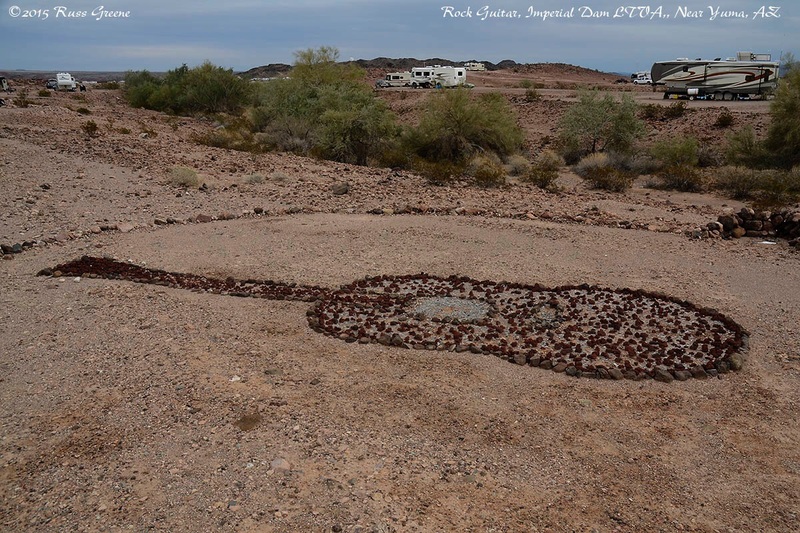 Of all the LTVA camping areas within the greater Imperial Dam LTVA–South Mesa, Gravel Pit, Hurricane Ridge, etc.–the South Mesa camping area where the Contact Station/Host is situated is the only area with a dump station, trash, and plumbed restrooms. 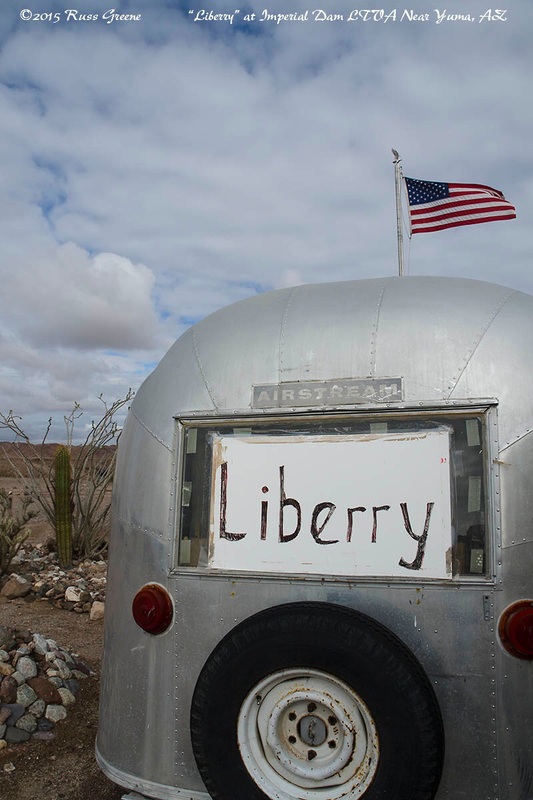 From South Mesa within the Imperial Dam LTVA it’s a 40-50 minute drive to the main Post Office in Yuma–Post Office proximity can be of greater concern for long-term campers. There is an alternative here. It’s the Christian Center which has a little Post Office of sorts. If you register at their office you can receive mail and packages there. You can send mail without registration. It’s only a few miles from South Mesa. Here too this proves to be a most interesting camping location. While I had a decent Verizon connection–most of the time–and no AT&T–except for a couple bars in isolated places–there is a gent, or at least there was when I was camped there, that for $1 a day would sell you wifi. He had a connection to a cell tower somewhere and had set up a couple wifi antennas which provided service to the area around South Mesa. See my WiFi notes above. Another option for connectivity is the Christian Center which has a little computer room with several workstations set up. It is also possible to connect to their network with portable devices such as smart phones and tablets which was the method I used. I took a quick look at the data download speed and it was very good. While there is no fee charged for the use of their network a donation of a dollar is suggested for 30 minutes use. Hours there are very limited: 9 AM-Noon M, T, Th, F. I believe their Post Office operates the same hours. Their phone is 760-572-0821 and if you register you can get phone messages there or from them via CB radio in emergencies. It’s PeeWee! 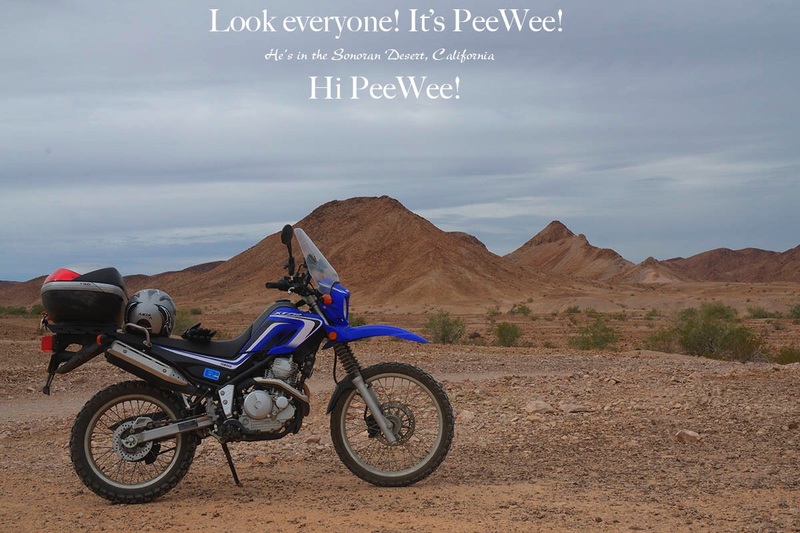 The Best Little Blue Motorcycle EVER!!! Speaking of CB radio, a few of the campers here have banded together to make sort of a voluntary emergency response team. They don’t offer medical care as I understand it, but they will get care here from the Yuma Army Proving Grounds faster than if you dial 911 for an ambulance from Yuma which is much further away. The response team will guide the Proving Grounds team to your RV which otherwise they might never find. Communications between campers and the volunteer team is on channel 12. I’m not sure I have all the facts straight on this topic but if you have a CB use channel 12 to check in and find out how things work. They have a roll call at 7 P.M. daily but the channel is monitored 24/7 from what I understand. Speaking of the Yuma Proving Grounds, it’s my understanding this is the largest facility of it’s kind in the USA and it’s right next door to the LTVA. It is used to test military equipment such as tanks and trucks, putting them to the test under rugged conditions. They also test ordinance there, apparently. I don’t think anything else could explain the distant rumblings that are sometimes heard, even felt, here. Occasionally a helicopter seemingly of military ilk has flown nearby. There’s not so much of any of this as to make it something you notice very often and I never found it anywhere close to annoying. It’s not really a consideration, in my opinion. Civilians can enter the base and shop at a little convenience store there, buy gas and even go bowling. See my notes in the NEAREST FACILITIES section above. 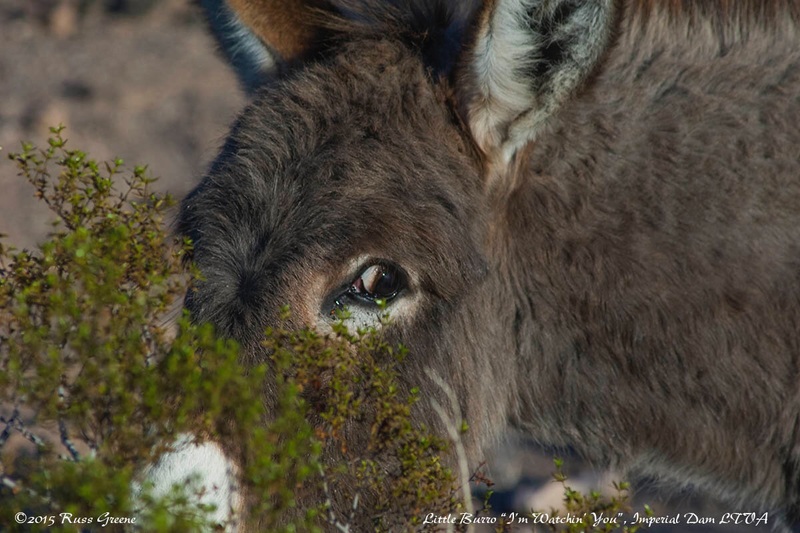 This little burro is keeping an eye out as he munches on his breakfast. There are a few small trees in places in the LTVA. Next to one of the Host sites in the mornings the birds sometimes make a lot of noise. Near my camping spot I’ve heard the soft sad song of mourning doves. I’ve seen quail here too and heard bird calls that I did not recognize. 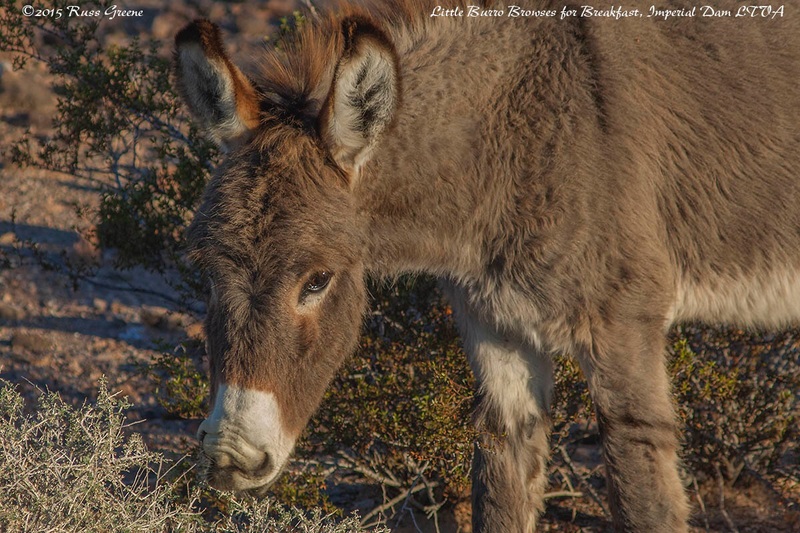 Coyotes can be heard singing at night and a couple times I saw a pair of burros wandering through the camping area. Although some campers have been know to pet them they are wild and may bite or kick. They sure are cute though. Senator Wash Reservoir is right at the South Mesa area and boating is allowed. I’m not sure what the restrictions are. It may be that only non-motorized craft are permitted. I believe nearby Squaw Lake also has some boating. 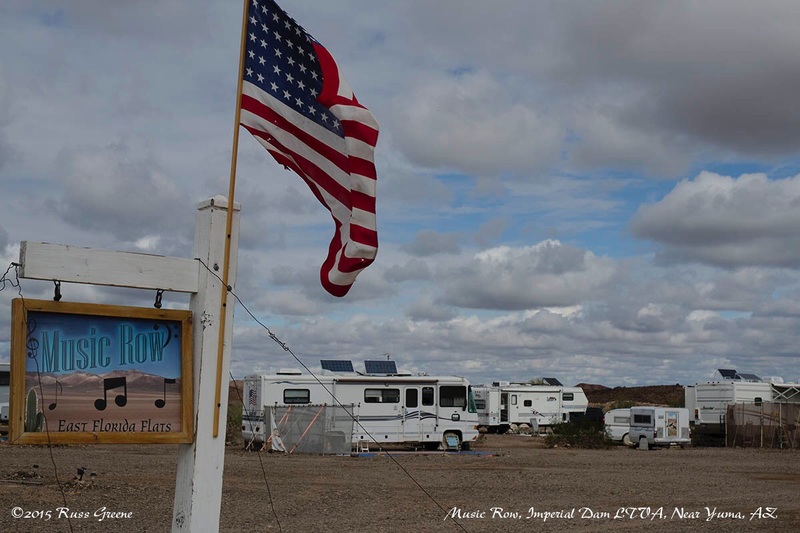 Both of these locations allow RV camping but not under the LTVA system. It’s $15 a night at these or for a $75 annual pass. You can stay up to 14 nights after which you must move to another location 25 miles away if it’s under the same permitting system. You could just move up into the LTVA but you’d need one of the two types of LTVA permits. A note on camping at the shore of Senator Wash Reservoir: it was quite picturesque when I arrived, but the water level can rise and fall quickly. People who were at the water’s edge one day were camping next to mud the next when water had been let out. Apparently the reservoir is used to maintain adequate flow of the Colorado River into Mexico under international treaty. If the river gets low then so too does the reservoir. As I wrote above, this is an interesting area. Separately, I’ve made several posts about it. The first in the series is here. Sounds very interesting – I enjoyed your whole series. One question I have is about how close you are to others since I like my privacy. It looks like named campgrounds have close neighbors but I get the impression you can camp away from the crowds as well. Is that the case? I wouldn’t really say it’s exactly like that. I don’t think there is any relationship of population density to whether or not a camping area is named. Notice that I say camping “area” because there aren’t really many clearly delineated campgrounds. There are some small named areas along Senator Wash Road such as Skunk Hollow and Quail Ridge that can only accommodate a small number of rigs but more commonly the areas tend to blend into each other with no borders. Much of the time you wouldn’t know what area you are in. I don’t really see a relationship between density and whether or not an area is named. My nearest neighbor is probably 100′ away. That has more to do with the lay of the land I think than anything else. Time of year is also a factor. Were there more demand for space somebody could roll up within 15′ of me if he wanted to, but things are already starting to thin out here. One reason I’m told has to do with Canadians needing to be back across the border to the north in order to avoid taxation of some sort. A great description of a wonderful place to spend at least part of the Winter. One additional note – Propane is also available at the gas station/convenience store at the Yuma Proving Grounds base. While a bit of a pain to enter, their hours are longer than the Christian Center. Great tip on the propane. Thanks!